Every year, Intel is present at Fashion Week in New York, showing off how technology will change fashion. It's an odd match, but the depth of technologies shown by Intel has changed every year. In previous years, Intel showed off cool bracelets, smart clothes, and an odd robotic spider dress by Dutch designer Anouk Wipprecht. Intel's 2017 showcase was a lot different and more practical, sprinkling in retail technologies with otherworldly wearables. That move to the practical, in a nutshell, describes Intel's tryst with its wearables unit -- from starting as a lab for cool devices to becoming a bootstrapped group focused on practical products amid the company's efforts to reduce wasted spending. Intel believes the best wearable products are yet to come, and it wants to change the way we interact with computing devices, share information, and even entertain ourselves. Intel is developing pursuing chips for wearables like Curie, which will be smaller and faster than the existing chip, and help make sleeker wearables, said Jerry Bautista, vice president and general manager for the New Devices Group at Intel. "We have to run just like any other responsible business effort that Intel has," Bautista said. The wearables group started off under the New Devices Group, established in 2013. Intel subsequently acquired companies like Basis to boost its wearables offerings but the unit didn't turn a profit. Amid restructuring, reports emerged last year that Intel had quit wearables. But the effort is still alive and more focused on delivering products that complement Intel's broader focus in areas like servers and the internet of things. Wearables are a pretty small operation at Intel, and it'll keep operating under the radar, said Nathan Brookwood, principal analyst at Insight 64. There are huge untapped markets in wearables, especially in vertical areas like health care. It's hard to say when Intel will find a commercially successful product, but the company will continue developing products, Brookwood said. "It's like Google: You keep throwing things against a wall, something may stick," Brookwood said. Despite a more disciplined approach, the cool products and bright ideas keep coming. Every trade show, Intel dazzles audiences with wearable technologies based on its chips and software. Intel's stage shows have featured Oscar winner A.R. Rahman playing music out of smartwatch-like devices, small shirt buttons that can gather health data, and helmets that can make driving cars and riding bikes safer. Intel has also shown its Project Alloy headset, a mixed-reality headset where objects pop up as floating images in mid-air. It's much like Microsoft's HoloLens -- which also uses Intel chips -- but with faster hardware. 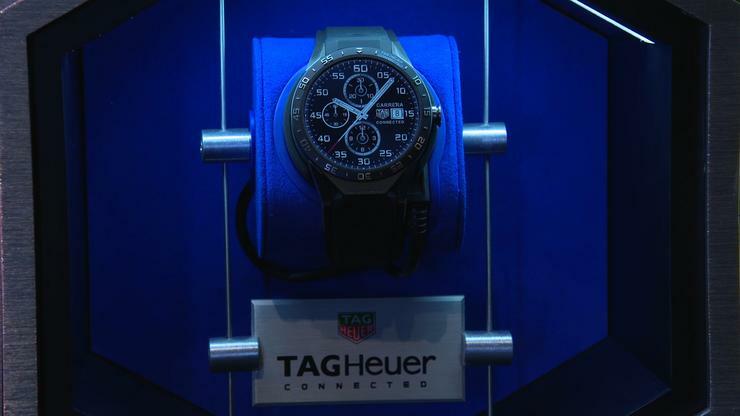 Recently, two smartwatches from New Balance's RunIQ and TAG Heuer's Connected Modular 45 carried Intel software and hardware technologies. An Oakley Pace Radar headset, which runs on Intel software, provides fitness guidance when training. The company's approach to wearables is being replicated in other areas like the Intel Sports Group, which is developing technology so users can watch 3D sports broadcasts as if they were in the stadium. One way to achieve that is by putting more cameras across the field, including helmets worn by players. Using algorithms, Intel servers slice and dice the images from the cameras to provide the customized footage. This will translate well to wearables like VR headsets, as users will be able to get a bird's eye view of a touchdown in a football game or a goal in soccer. Chips like Curie are already instrumental in improving the sports viewing experience from events like last year's Winter X Games. In real time, viewers were able to view key athlete performance data like the height of a snowboarder jump and how far they rotated. The data was captured from the Curie chip and sensors on the snowboards. Data has become extremely valuable, and wearables can help gather more information, especially biometrics. Wearables are edge devices that collect data and feed them to into the large flow of data being sent to cloud servers for analysis, Intel's Bautista said. In some way, one could think of wearables as an extension to Intel's interest in IoT, and it is in some ways similar to other technologies like connected thermostats and consumer sensor devices, Bautista said. Intel cares about how the collected data is analyzed and presented to the user, Bautista said. Wearables will be key for health-care application development, and Insight 64 analyst Brookwood identified galvanized skin response as a big wearable opportunity that Intel could pursue. Wearables also fuel the development of software applications that can be used for analytics, Bautista said. For example, Intel is developing software tools that will bring artificial intelligence to smartwatches like the new Tag Heuer smartwatch with Android Wear 2.0. Intel is taking an open architecture approach to IoT devices and wearables, and a device doesn't have to be tied to x86 chips. When planning the recently released smartwatches, Intel looked at the best chip and software that may fit into a device. Intel has packed the x86 Atom smartphone chips in the recent New Balance and TAG Heuer smartwatches, but it has put ARM processors into other wearables. It remains to be seen how long Intel plays in wearables, Brookwood said. The wearables market will take years to mature, so Intel has to remain in it for the long haul. At the same time, Intel has failed in many of its consumer-facing efforts, especially in media and TV. If Intel technology doesn't power a hit wearable device in the coming years, the effort could be canned. The days of Intel splashing money at efforts that don't produce are gone, Brookwood said.